Charles Biederman was born in Cleveland, Ohio in 1906. He studied at the Cleveland Art Institute before enrolling at the School of the Art Institute of Chicago. Biederman was talented, receiving the prestigious Paul Trebeilcock Prize, but he dropped out of school in 1929 due to ideological differences with the faculty. Biederman spent formative years working in Chicago, New York and Paris, encountering and befriending leading abstract and Cubist artists of the time, such as Piet Mondrian, Constantin Brancusi, Hans Arp, Joan Miró and Fernand Léger. Biederman spent two intense years in New York City from September 1934 to September 1936, during which time the present work was completed. Working out of a studio in Washington Square, Biederman was inspired by the city and the art scene around him. Biederman made use of the most notable artistic resource of the neighborhood, Albert E. Gallatin’s Museum of Living Art. Installed in the reading room of the New York University’s downtown campus, this groundbreaking collection of the latest in modern art featured important works by Léger, Miró, and Mondrian. Biederman also met the “Park Avenue Cubists” George L.K. Morris, Suzy Frelinghuysen, and Charles Green Shaw, a group whose works reflected the tenets of Abstraction and Cubism. After studying the modern artworks within Gallatin’s collection and visiting the studios of the progressive New York artists, Biederman developed his own innovative take on Modernism. Between 1934 and 1936, Biederman produced a large body of work that blended the influence of Cubism, Surrealism, and Abstraction. 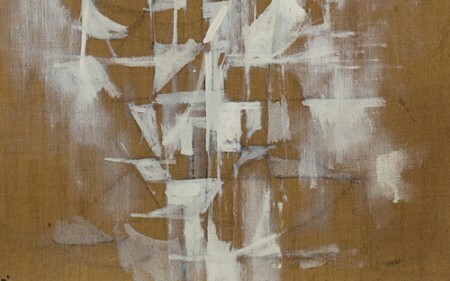 His progressively modern paintings, along with groups such as the American Abstract Artists, would go on to inspire countless American painters in the decades to follow when non-objective art was continually met with critical reviews. Their groundbreaking work paved the way for the American Abstract Expressionists who followed in the post-war years. Figure 1. Joan Miró, Peinture, 1933, oil on canvas, Fundació Joan Miró, Barcelona, on loan from the collection of Maria Dolors Miró Juncosa. The present work perfectly illustrates Biederman’s artistic philosophy that he developed in New York during the 1930s, showing direct influence to European models while also demonstrating a unique style. The large composition lacks narrative or recognizable imagery, and instead explores abstract form, color, and space. 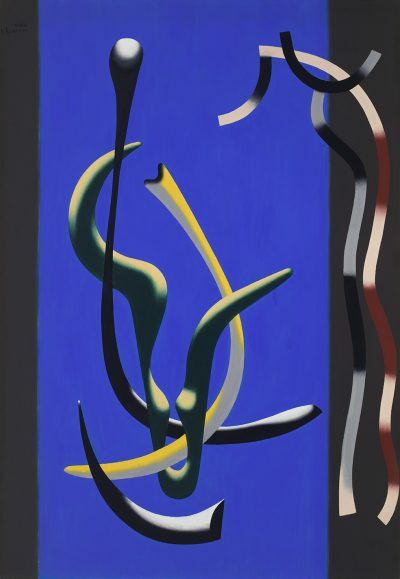 Biomorphic shapes and flat, ribbon-like lines are painted to emphasize the vertical format of the canvas. 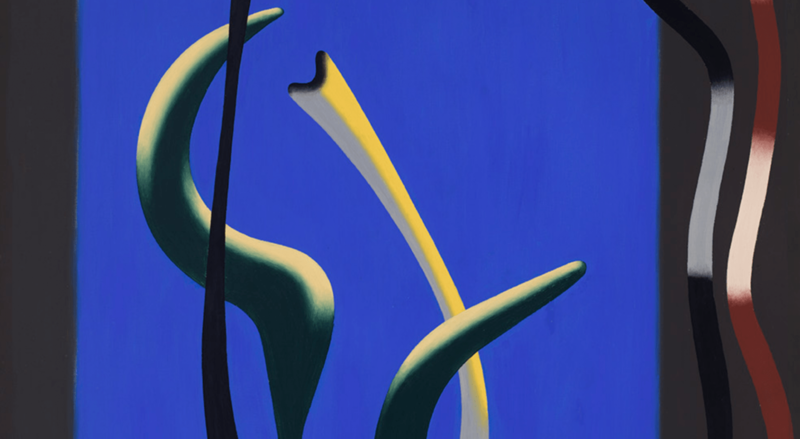 The sinuous linear objects are rendered with depth and volume, in a style that evokes early Surrealist paintings of Picasso and the high-polish finish and tubular forms of Léger. 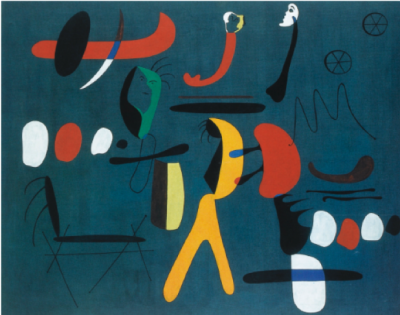 The influence of Miró is also evident in the floating organic objects set against the radiant and saturated background of blue and black paint (Figure 1). Biederman’s abstract and biomorphic composition bears comparison with Alexander Calder’s later Constellation sculptures (Figure 2). Figure 2. 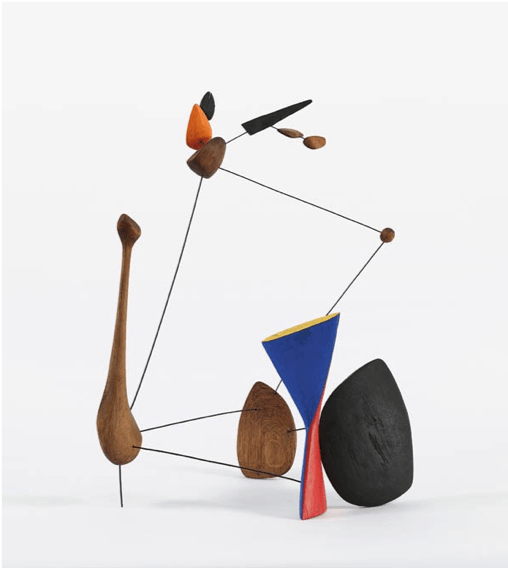 Alexander Calder, Constellation with Diabolo, 1943, wood, wire and paint, 24 ½ x 18 ¼ x 16 inches, private collection. Biederman’s work in New York earned him attention and acclaim from the art community on both sides of the Atlantic. 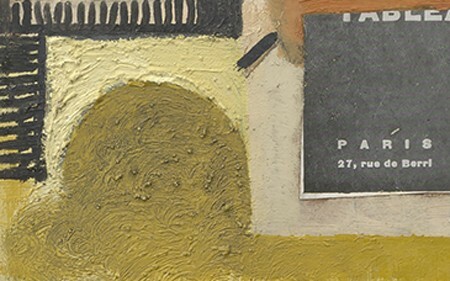 In March of 1936, Gallatin organized Five Contemporary American Concretionists, a groundbreaking show at the Paul Reinhardt Gallery in New York. The five American artists were Biederman, Calder, John Ferren, George L.K. Morris, and Charles Green Shaw. 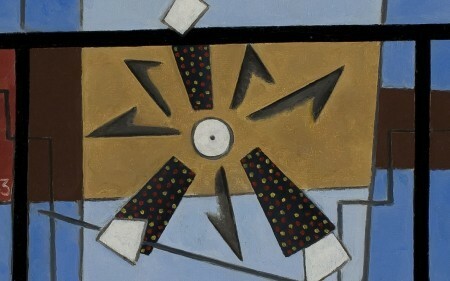 The exhibition was a reaction to the omission of American artists at the Cubism and Abstraction exhibition at the Museum of Modern Art (Calder was the only American included in the show). Gallatin’s exhibition, and a subsequent solo exhibition at Pierre Matisse Gallery in New York helped to elevate the profile of American abstraction and put Biederman on the map.